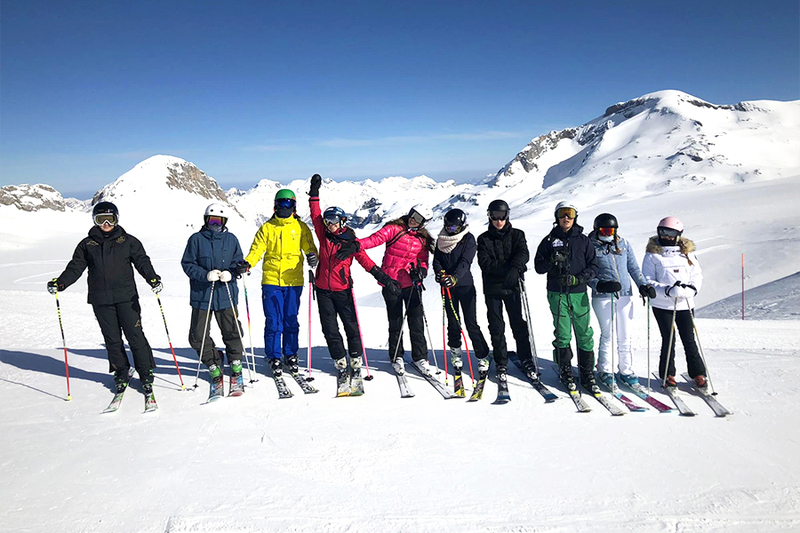 Throughout the year, perhaps with the exception of International Week, Ski Adventure is the event that stirs up the most excitement among students. Both students and teachers look forward to this trip, as it replenishes much-needed energy toward the end of the year. Not only do teachers and students become more comfortable with one another, but students are also given the chance to establish new friendships with those outside their immediate circle. Ski Adventure is the opportunity to replace school and homework with skiing and adventure. A week like Ski Adventure must be far from easy to arrange, so we offer a huge thank you to Ski Adventure Coordinator Mr. Paul Diviani all the teachers who made this great week happen successfully! The separation into groups for skiing lessons permitted us to meet new people and to get to know our classmates we see but never hear. In our ski groups we spent a total of three hours in the morning and afternoon together. During our lessons we were able to enjoy the mountains and the breathtaking scenery. Personally I was amazed at the sights, even though it was my third time back—each time I see the mountains in a different way. I was left in awe as I skied down slopes with a view that was etched in my mind, body, and soul. a 1980s-style look at this year’s Ski Adventure in Crans-Montana, Switzerland. This week is therapeutic for me because it provides a new mindset and gives a calmness that is much needed to complete the rest of the school year. In between morning and afternoon classes, we were able to have a three-hour break to do whatever we please. I used this time to dine in a restaurant on the top of the mountain that revealed a striking view that extended all the way to the horizon. On our day off from skiing lessons, we were permitted to do whatever we wanted on the grounds. However, my friends and I took that free time to explore the mountains on our own. We skied that whole morning, going to the top of the mountain, which was 3000 meters above sea level. This skiing experience I shared with my friends is something almost surreal for a high school student. Where I am from in New York, school-organized trips were to a museum or maybe to Washington, DC, for a week-long trip, but there was nothing close to something as exciting as skiing in Switzerland. In spite of the bitterness of the -30° weather, I let my soul soak in the freshness of the air, the pureness of the snow, and the brightness of the sun—they occupy a special place in my memory, as pure perfection. Up on those slopes I had no worries and no stress; it was me again, and I was left in a state of relief and balance. Photo taken by Maxim Eremeev ’20. See a full gallery of photos on the TASIS SmugMug page. There were also activities in the afternoon. This year there was snowshoeing and snowtubing. 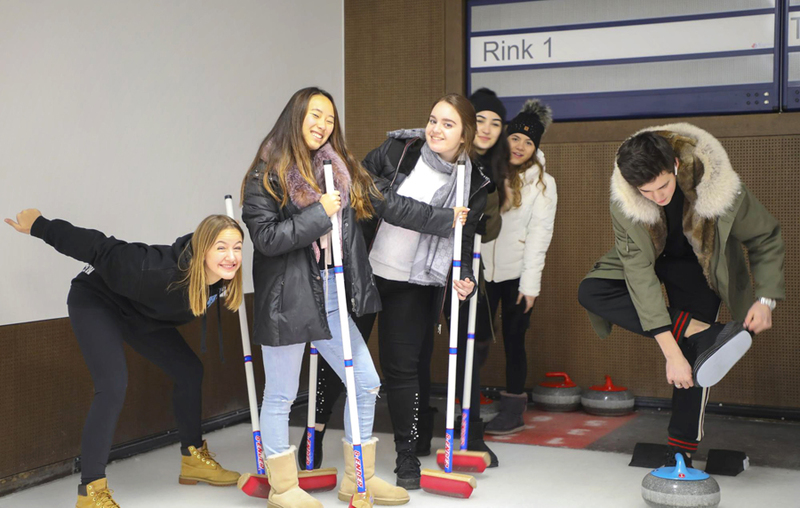 These activities are typically enjoyed by the majority of the students because they allow us to interact with the entirety of the Academic Travel group while doing something other than skiing. My favorite activity was the one that was optional: yoga. (Thank you to Mrs. Walser for offering this to us.) The yoga class was beautiful and a blessing to my beaten-up body, as my friends and I had skied the whole day, even during the three-hour break that was left for rest and food. Coming back to the camp, our bodies hurt, and we were in a torturous pain that felt as though it would never leave and would never heal. The last thing I wanted to do was yoga, but I convinced myself I would get much-needed regeneration for my body. During that class I was exposed to the unknown exploration of movements that connect both mind and body, and they left my body feeling reborn and stronger. Throughout the week, we were able to spend time with friends and nature, which are both important for our mentality. 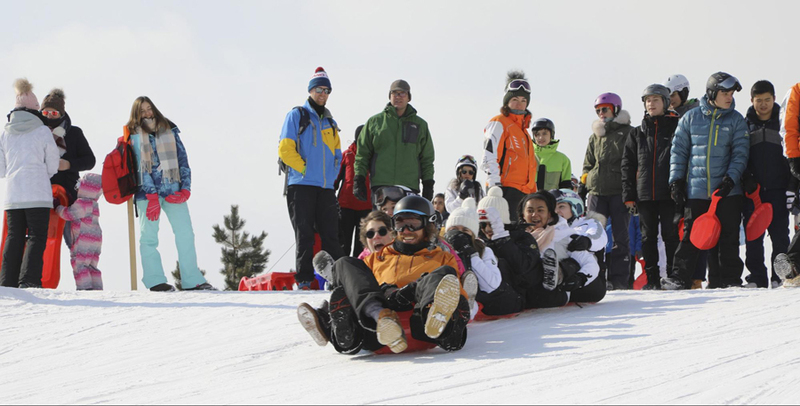 All of us students face major changes and choices toward the end of the year, so trips like Ski Adventure relieve our minds of stress and negativity. This was my third year going, and I fell in love with Ski Adventure in a different way—a way that has its own uniqueness—and I blissfully await my return to Crans-Montana for my senior year. which Alex Secilmis '19 and Sasha Tsenter '19 helped Milo Zanecchia '08 create.